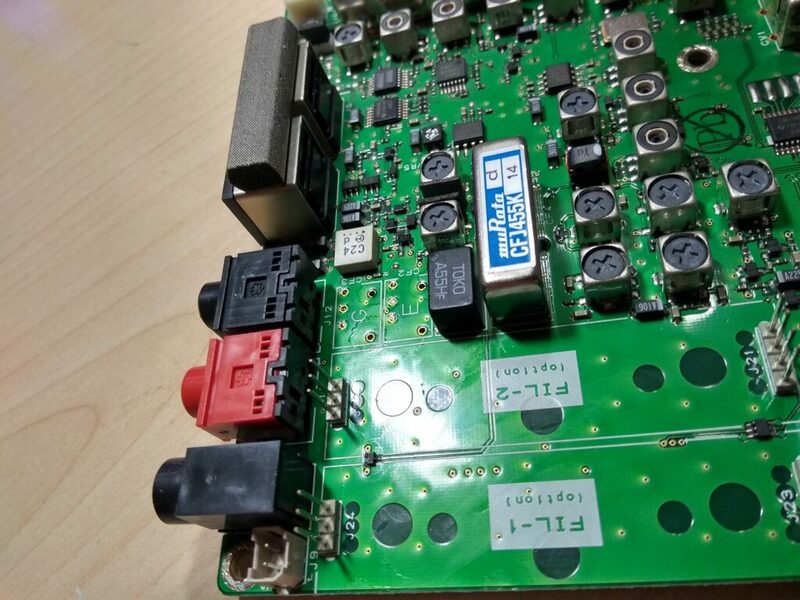 FT-2000 – Deaf as well? 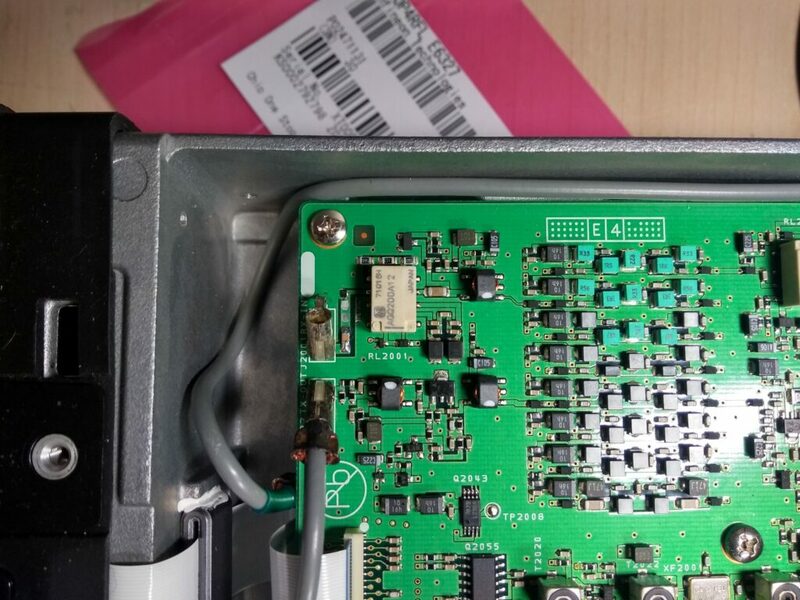 I recently had a look under the hood of an FT-2000; and just as I’m done repairing two FT-897; I notice that the FT-2000 should be a suspect as well! Yaesu: what gives?! You can see the same white oxide leaking out of the porous plactic of those filters. A warning to FT-2000 users: you should check them periodically. In our local ham radio club ( UBA-ARA ) – two of our club members had a Yaesu FT-897 who seemed deaf in certain modes. I took both transceivers home with me and took a closer look. You can see some white deposit on those filters. 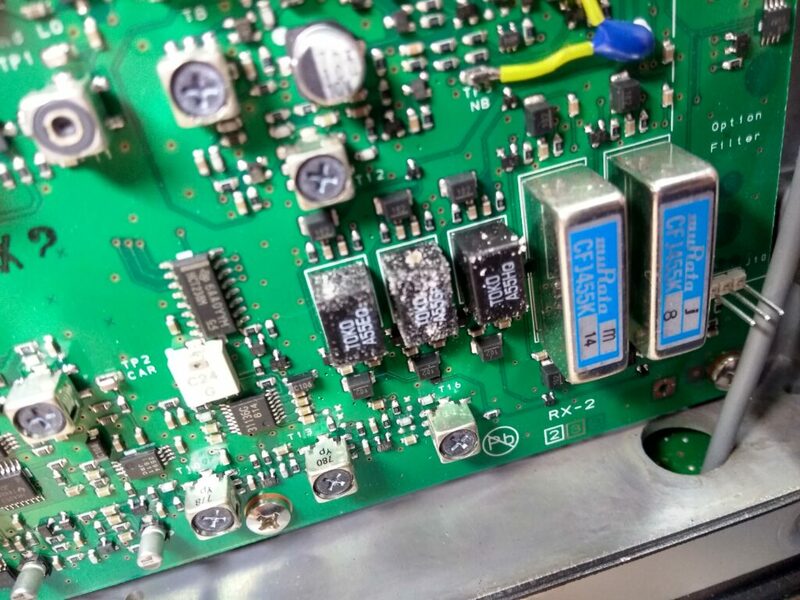 My guess is that after re-flow/wave soldering these boards, Yaesu probably washes these PCB’s. However, the plastic used in these filter either is brittle, porous, or the bottom isn’t hermetically sealed. You can clearly see the copper oxide. No wonder this thing was deaf! Anyway, it’s worth opening up your transceiver if you have an FT-897 to check and see if there’s any of that white “powder” on those filters. Big red flag if you see it. I’ve always wondered why my FT-450 I bought second hand had a lower RX level on the higher bands, starting around the 20m band. I took a look at the schematic, and the input on the RX side is very classic: a DC blocking cap and protection diodes. 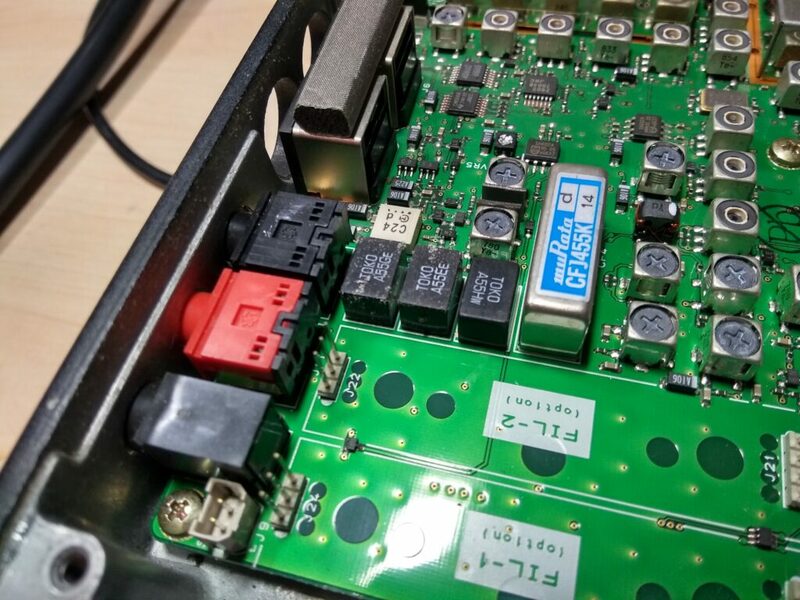 Protection diodes, wait – those aren’t RF protection diodes; they are bog standard SMD red LED’s! What was Yaesu thinking here? (“Let’s save 2 cents?”). Only reason they might have used these (and the only reason I can think of) – is that they maybe have a low capacitance. But seriously, Yaesu.. ? Anyway, I set my multimeter to the diode setting and quickly realized that one of them was shorted. 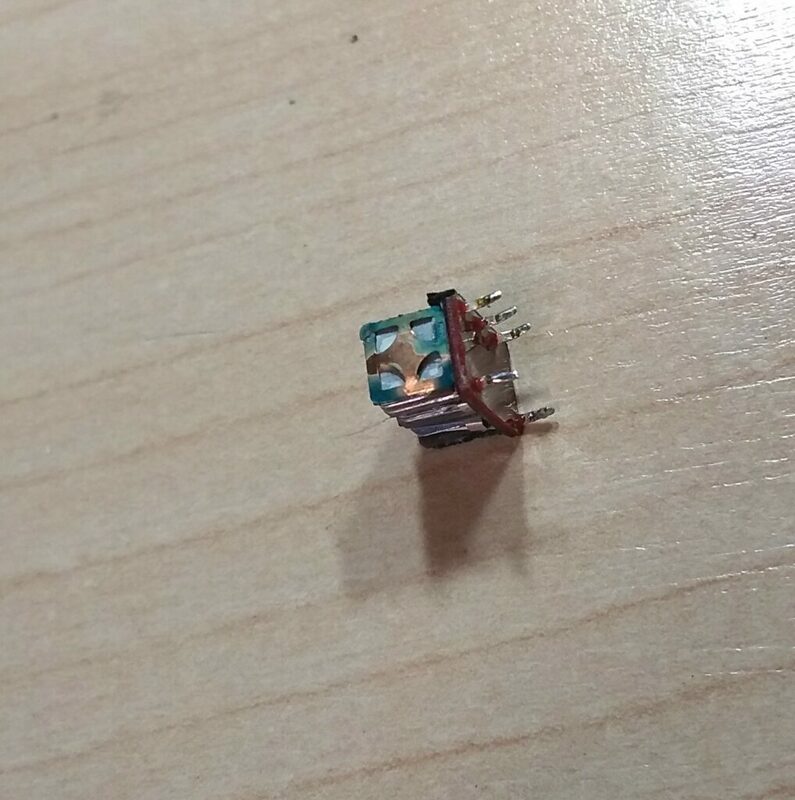 Really, who tries to use LED’s as protection diodes? Really not up to the task. Here’s one that was still working. 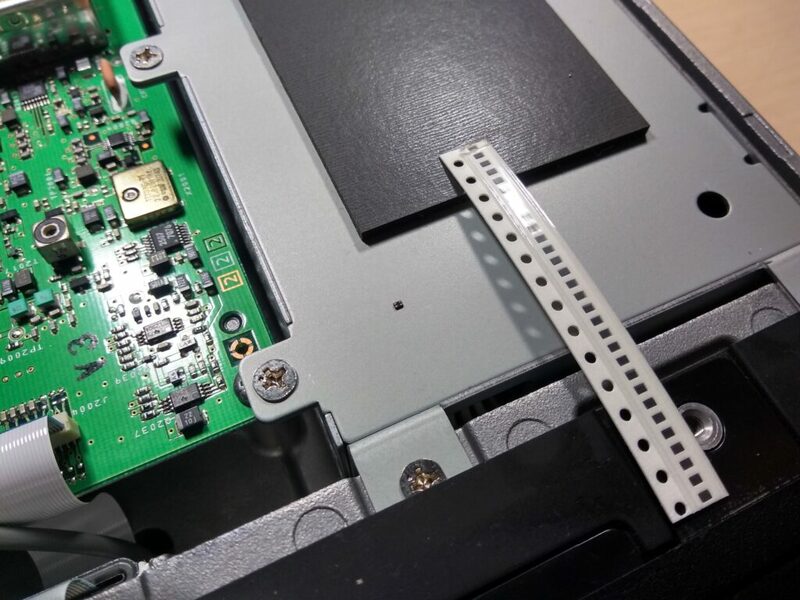 The picture gives a good indication where you can find them on the PCB (underside of the transceiver). I cleaned up the original location of the LED’s with some solder wick; also cleaning any flux residue on the board with IPA as flux does have a capacitive effect. I removed a bit of solder mask up the trace a bit as to fit the component correctly and applied some solder paste before re-flowing the part. Measures like a standard diode with a voltage drop of about 0.6 V – so easy to verify. It’s really small compared to the original LED’s – check it out at the bottom right of the trace. Overall if you have a FT-450 – check that these aren’t already blown. I see *some* complaints about bad RX on these transceivers, but that’s really not the case *if* these diodes aren’t blown. So check up front, and replace “just in case” would be my advice. Yaesu FTM-100D – the best Fusion – no wait – .. DMR radio?